Guide to Badger Church. Click here to download a copy (Word Document 299Kbs). This includes information not found on this website. 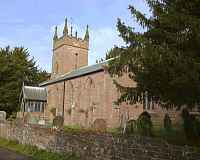 No place of worship is known in Badger until the 12th century. It is possible that the date of the present tower dates from then. The first known Rector of Badger was ROGER, clerk of Baggesor about 1174. The 15th century screen originally separated nave from tiny chapel which was built by the Capel Cure family. In the chapel are several memorials to various families who owned the estate, commissioned from well-known sculptors: Chantrey, Flaxman and John Gibson. In the nave is another memorial by John Gibson, but perhaps the most delightful of all the memorials is the one which tells of long service to the village in recent times. It shows children poring over their books, and was set up in memory of Emma Grainger, the schoolmistress for 42 years. To the left of the church door as you enter the church is a new window installed in memory of Dr.Margaret Dix and her father, the Rev. Archibald Dix, who was Rector of Badger for almost half a century. The window reflects Margaret Dix's interests and skills - she was a world-renowned inner ear surgeon. A description of the window is on the wall just inside the church door. Outside in the churchyard are the remains of a medieval village cross. If you would like to know more about our church or have any queries then please contact us.